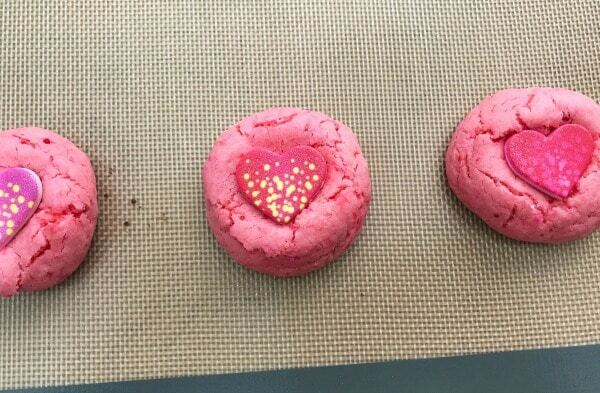 Strawberry Candy Heart Cookies combine three of my favorite things! These yummy cookies also make delicious Valentine’s Day treats! Ever since I was a kid, Valentine’s Day has been one of my most favorite holidays. Unlike some of the other popular holidays, there isn’t the same pressure to start planning and preparing for it weeks (or even months) in advance. A simple token or expression of your love for those you care about is sufficient. Whether it’s a handwritten note, a store-bought surprise, or a homemade treat, the focus really is on the meaning not the item. 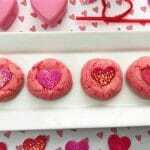 These Strawberry Candy Heart Cookies are very easy to make and share. They’re a perfect way to show your friends and family you appreciate them. 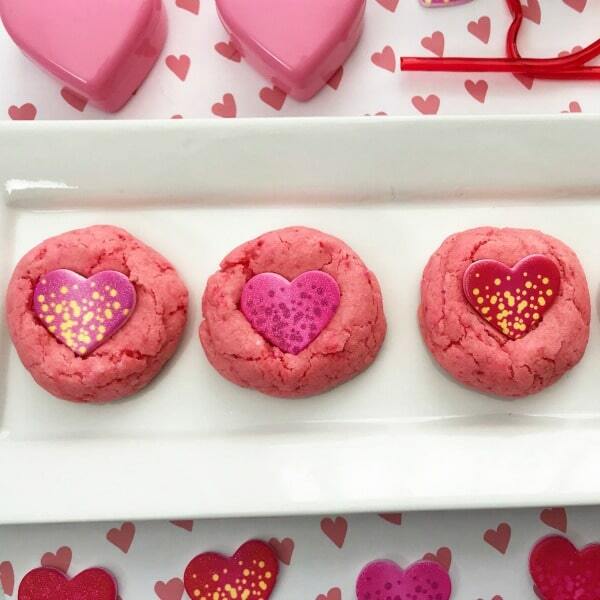 Pink is a great color for Valentine’s Day and these cookies are the prettiest shade of pink. The darling hearts in the center of each cookie just bring the whole treat together. 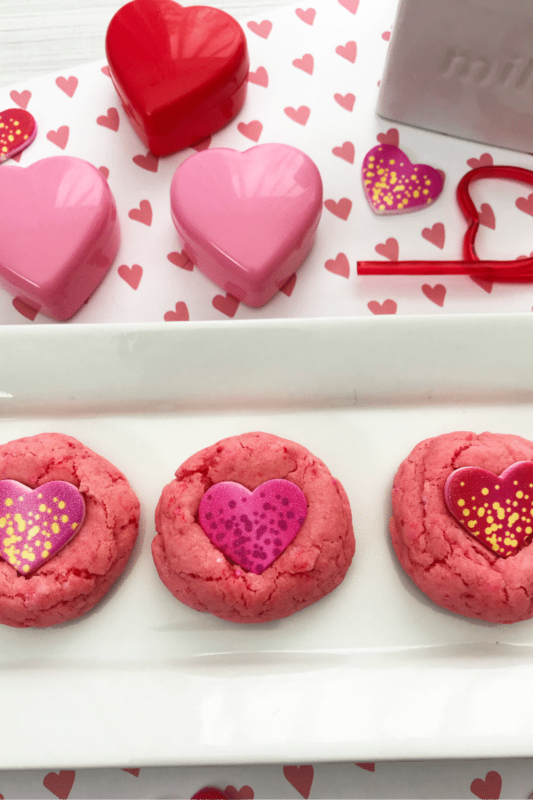 There won’t be a child in class who will be able to pass up nibbling on one of these Strawberry Candy Heart Cookies during the party. I love to find recipes that my kids can help me make. Getting kids into the kitchen earlier helps them build so many skills. It is fun to watch them learn to measure and read recipe instructions. I have found my kids get more excited when we are making something they consider to be FUN. Strawberry Candy Heart Cookies fall into the fun category for sure. Nothing makes me happier than an easy recipe. I love how simple the recipe for these Strawberry Candy Heart Cookies are to make yet they look like I spent all day in the kitchen! Preheat the oven to 350 degrees. Line your baking sheet with a silicone baking mat or parchment paper for the best cookie results. 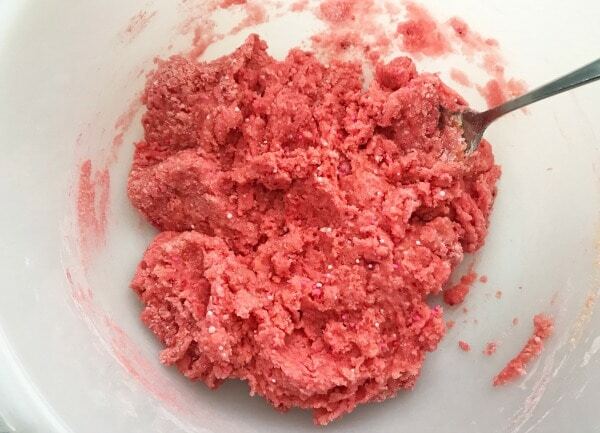 In a large mixing bowl add the strawberry cake mix , vegetable oil, eggs and flour. Stir well to combine the ingredients. 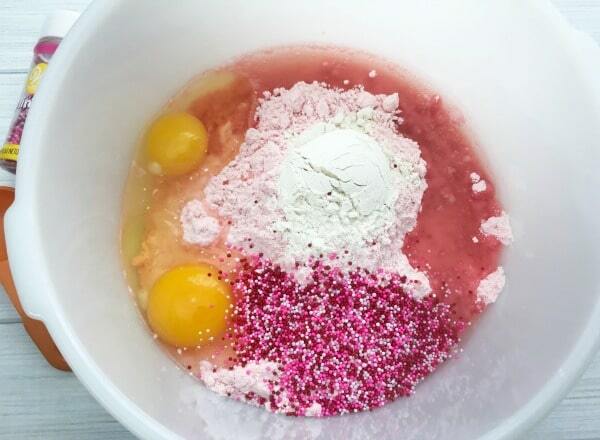 Add in the colorful sprinkles and stir to combine. Take a small cookie scoop and roll the cookie dough into 2 inch balls. 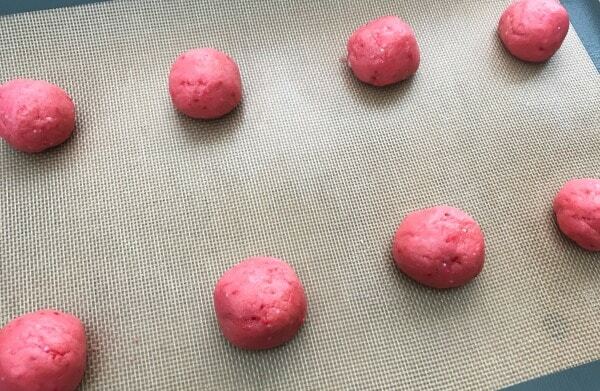 Place each cookie ball onto the baking sheet about 2-3 inches apart. Take the cookies out of the oven and place one heart candy on top of each cookie. This recipe makes approximately 12 cookies. 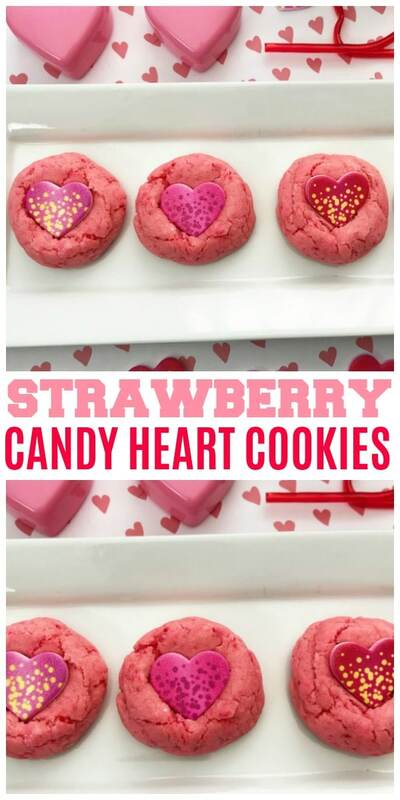 If you are ready to make some of these adorable Strawberry Candy Heart Cookies you can download and print off the recipe below. Strawberry Candy Heart Cookies are the perfect dessert for Valentine's Day. This is an easy recipe made with a cake mix. Remove from the oven, let cool a few minutes and gently press one candy heart on top of the top of each cookie. Valentine’s Day will be here soon and you can make the whole day special with my ideas below! Bright, colorful and easy… thanks for bringing to the Fiesta! Perfect for Valentines! And perfect for the kids and us adults that are kids at heart! Thanks for sharing with us at Fiesta Friday! love this idea! Thanks for sharing at To Grandma’s House We Go DIY, Crafts, Recipes and more Link Party. I pinned this! Hope to have you join us again next week. Great recipe. Pining it and forwarding. 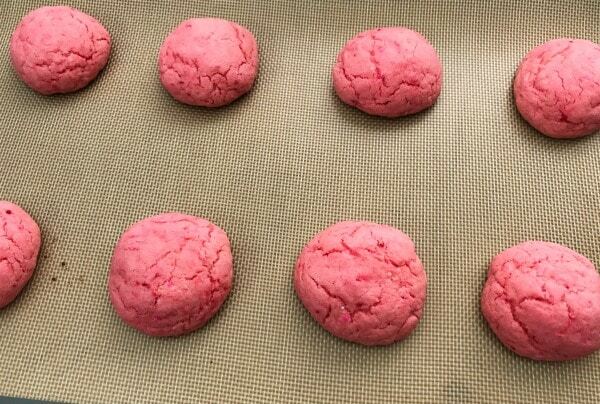 Super cute pink cookies! I’ve never thought about it, but yes Valentine’s requires no extra planning! Holidays are great but it’s fun to have a break. Thanks for sharing at Merry Monday!